We’d love your help. 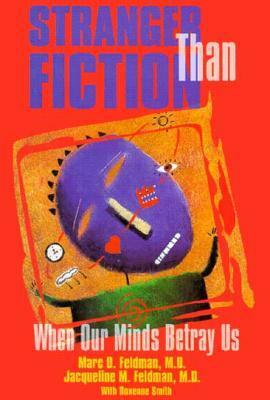 Let us know what’s wrong with this preview of Stranger Than Fiction by Marc D. Feldman. This is a spellbinding invitation into the world of the human mind that will change our perceptions of mental illness. Despite the growing body of scientific discoveries into the nature of the human mind, the stigma attached to mental illness remains deeply entrenched in the general public's consciousness, the product of inaccurate information. To ask other readers questions about Stranger Than Fiction, please sign up. All the reviews I read were intriguing and I have always been interested in abnormal psychology - how our brain works and what we react and feel "When our Minds Betray Us". It was more like a dry textbook and not interesting at all. I have read tons of textbook within the past 5 years and am not disinclined to read more, but this book in my opinion is just poorly written. Once I started reading, I drifted off and skipped and soon I disinterest won over a This book was not what I expected it to be. Once I started reading, I drifted off and skipped and soon I disinterest won over and so I closed the book.